The Evil Within 2 has kept me up at night. The culprit is a recurring vision that has managed to escape the game and embed itself, rather nastily, in my subconscious. It is of a pile of severed corpses assembling themselves into a cackling, writhing mass of limbs and faces – they do this all by themselves, gliding eerily across the floor at first before snapping into place like iron filings around a magnet. Related: The Evil Within 2’s crafting, weapons, and upgrades explained. In spite of some (hopefully) temporary mental scarring, I have thoroughly enjoyed every nightmarish minute of The Evil Within 2. 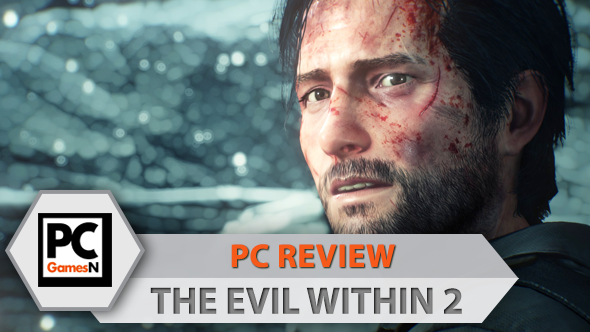 This is far more than a throwback to the haunting atmosphere and pacing of Resident Evil 4, The Evil Within 2 is entirely its own horror experience: visually arresting, deeply unsettling, and riveting from start to finish. Gone are tedious horror tropes like out-of-control psychiatric hospitals and brutes with chainsaws. They are replaced by mind-bending P.T.-esque environmental morphs and monsters made of gore and goop, all housed in a modern, archetypal American town called Union. You play as the beleaguered Sebastian Castellanos, who has been dragged from a dive bar where he drinks away the sorrows of the first game and brought to the headquarters of nefarious mega-corp Mobius. It is revealed to us that Sebastian’s daughter, Lily, is not dead, but is currently trapped within STEM, a terminus that connects multiple brains together in a virtual world. Of course, somebody let a few murderous psychopaths in by mistake and now the town of Union is literally breaking apart. The vast majority of its denizens are dead, but have risen again due to some unexplained infection, and now wander the streets. Your job is to enter STEM, find Lily, and figure out what went wrong. 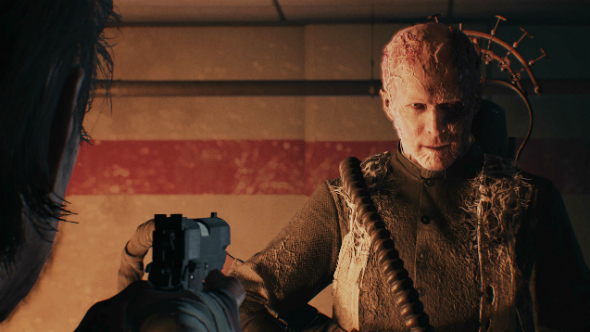 Those infected make up the bulk of the foes you face in The Evil Within 2, and while they look like humble, shambling zombies, they are a damn sight more devious. For starters, they run, which is pant-messing scary. They are also incredibly erratic, rarely sticking to the same patrol route and spinning around at unpredictable intervals to catch you off guard. Even tried-and-tested tricks like luring them close to you by lobbing a bottle are prone to disaster unless you time your approach to perfection. Variants include spectral, dagger-wielding ladies who are immune to stealth takedowns; towering, acid-lobbing collections of flesh; bloated masses of boils that explode after dying, showering the environment in entrails; and actual human centipedes that are adept jukers. When sneaking up on these enemies goes wrong you have two options: run or fight. The former can work in open areas, but in arterial tunnels and pitch-black houses only the latter will do. Thankfully, The Evil Within 2 boasts an arsenal of satisfyingly destructive firearms for when things go awry, which is often. Very often. 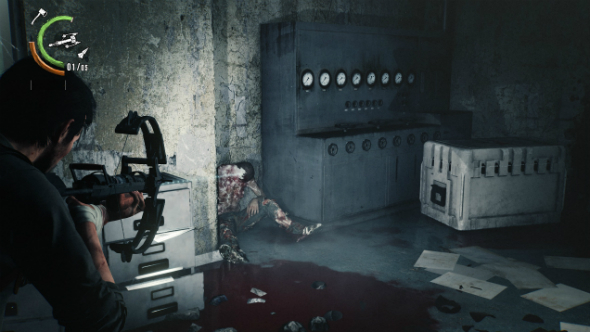 As ever is the case in survival horror games, the shotgun is the highlight, capable of knocking several enemies down with a single shot, leaving you free to run in and finish off any survivors with the heel of your boot. 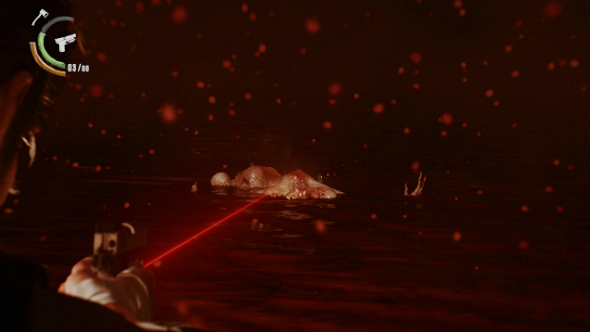 A laser-sighted pistol is agonisingly ineffective when landing body shots, but managing to hover that red dot over a weak spot as you squeeze the trigger results in an explosion of gore. Every weapon feels heavy thanks to some realistically unforgiving reticle sway and recoil – hitting an enemy who is sprinting towards you feels akin to a miracle rather than a feat of marksmanship. 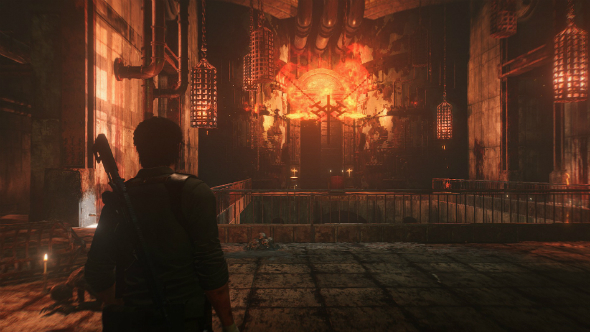 Shinji Mikami might have surrendered the director’s chair to Evil Within game designer John Johanas, but rest assured that The Evil Within 2 still bears all the hallmarks of a classic survival horror game. While I always felt safest with a fully loaded shotgun equipped, The Evil Within 2 never let me get too comfortable with any one weapon, and ammo shortages left me fighting close-quarters battles with a sniper rifle more than once. The Warden Crossbow should suit strategists down to the ground, allowing you to set traps around the environment with a variety of bolts: freeze, smoke, explosion, and shock. Using explosive bolts to set up a series of trip wires along a corridor before baiting a crowd of infected into them is an amusing alternative to the usually binary combat options you are given in survival horror games: loud or quiet. The freeze bolt is especially fun to use on tougher monstrosities, letting you finish them off with a hand axe, shattering the normally formidable creature like a pane of glass. You won’t find nearly enough ammo lying around the world to defeat every enemy you come across, so making the most of these bolts is essential. Likewise, most areas in the game have oil barrels you can kick over or fire hydrants that you can open up, letting you burn a few enemies to death with a single bullet or electrify them with a shock bolt, depending on which spillage you are able to lure them into. Crafting is another means of keeping Sebastian in the fight and The Evil Within 2 massively expands on the crafting options available in the first game, letting you jury-rig healing syringes, ammo, weapons. The most important component is gunpowder, which lets you craft bullets and bolts, but doing so away from a workbench uses almost twice as much gunpowder, forcing you to constantly weigh up whether to try and persevere with the two handgun rounds you’ve got, or waste potentially vital components crafting a couple of shotgun shells. The scarcity of these resources ensures that exploration never feels wasted. I have sighed with relief countless times after finding a stack of gunpowder in a drawer or a couple of shotgun shells tucked behind a corpse – imagine my heartbreak upon missing three consecutive shots. Union is the real star of The Evil Within 2: a fractal mess of environments that allow for open-world tactical play and resource gathering in one chapter, before dropping you into a claustrophobic torture dungeon in the next. Seemingly small detours into garages lead into side-quests that reveal vignettes of the town’s descent into chaos – it is easy to lose hours exploring every nook and cranny of these modestly-sized areas. At the very least, you will find some crafting components, weapon parts to improve your arsenal with, or Green Gel, which is the returning upgrade currency from The Evil Within that lets you buff Sebastian with a selection of minor traits. Developers Tango Gameworks clearly know when to rein things in, which is evidenced as you inch through an abandoned mansion for ten minutes without firing a single shot, tension amping up with clever sound design and the odd transforming passageway to escalate the terror. It is testament to the level of craftsmanship poured into every locale that The Evil Within 2 manages to sweat my palms without resorting to jump-scares. If fact, the sheer breadth of environments you journey across throughout The Evil Within 2’s 17 chapters is by far its greatest achievement. What begins as a traipse through a zombie-addled post-apocalyptic vision of smalltown USA quickly turns into an odyssey through every nightmare scenario imaginable: sterile facility, dank sewer network, medieval torture dungeon, chthonic chambers full of blood, dilapidated mansion, cabin in the woods, smelting works, and more besides. The Evil Within 2 is a visual feast, and every new setting brings a shift in pace and tone that sets it apart from the one you came from. Surprisingly, given the well-worn dad saving daughter structure it is based around, the story of The Evil Within 2 is gripping once it gets going, and as I approached its final few chapters I found myself racing through fights to reach its conclusion. Sebastian is as pedestrian as ever in his moment-to-moment remarks, but enough personality is injected through beautifully staged cinematics to make me increasingly empathetic to his plight. Despite the bonkers overarching narrative, Sebastian’s story remains an astonishingly grounded tale of parental guilt. The Evil Within 2 is entirely its own horror experience – part open-world survival game, part psychological horror. It is a bold, bloody evolution of the survival horror genre. Moreover, like its centipedal monstrosities, this is a game that excels at defying expectations. Scenery, gameplay, and pacing shift gears constantly, keeping me guessing nearly every minute of the 20 hours it took to reach the end of its story. It is also a game that is at odds with its predecessor, implying the bulk of its horrors rather than showing them to you, opting more often for open design over confined corridor chases. 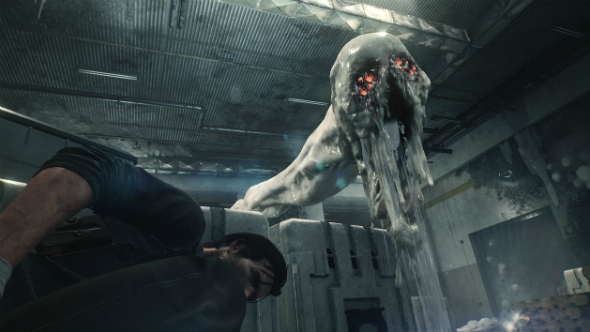 But at its core, The Evil Within 2 is still a survival horror experience, a modern take on the time-honoured suspense of having only one round but two deranged enemies lurching towards you.